Watermarking digital documents, such as PDFs or Microsoft Office files (like Word, Excel, and Powerpoint documents) is an essential step in protecting documents. Watermarks are words - for example "Do Not Distribute" - or designs placed on a piece of work that vary greatly in their designs, size, shade, and shape, but all serve the same set of purposes. Those purposes are to identify the original owner or author of the content, and to serve as a security precaution to discourage people from misusing the content. Watermark is an important component of DRM (Digital Rights Management) software solutions because it offers an additional layer of security for your content. As watermarks can be used to identify the original owner or author of the content, they discourage users from misrepresenting the content as if it was their own as well as unauthorized distribution. Other watermarks can convey a message to the reader to warn or caution them from mishandling the content, such as sharing it illegally with unauthorized parties. Some content security and DRM software, like Vitrium Security, offer dynamic watermarking which allows the watermark to create a customized message depending on some pre-determine variables. Below is an example demonstrating a dynamic watermark. As you can see, the watermark displays the reader’s username and it will change depending on the individual that is unlocking the document. 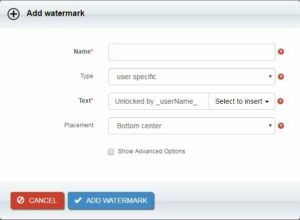 Dynamic watermarks use a custom value relating to the user of the content to mark the document. Vitrium works with clients in various industries that use our DRM technology to secure their content. Many of them take advantage of the watermarking feature available. Clients in the education or training industries use the dynamic watermark feature to discourage users from sharing their revenue generating content, which is pivotal to the company’s success. Other clients use Vitrium Security's watermark functionality to secure documents with their intellectual properties and proprietary information. If that information is leaked or shared, the owner can track and see when and who accessed the documents through the use of the dynamic watermarking feature. For most users, seeing your name printed on a document is enough incentive to not share or use the content inappropriately. As you can see, watermark plays an important role in protecting content. Regardless of how you choose to use a watermark, it will provide an additional layer of security to your content by enforcing accountability for those that purchase or that you chose to share your content with.